1. 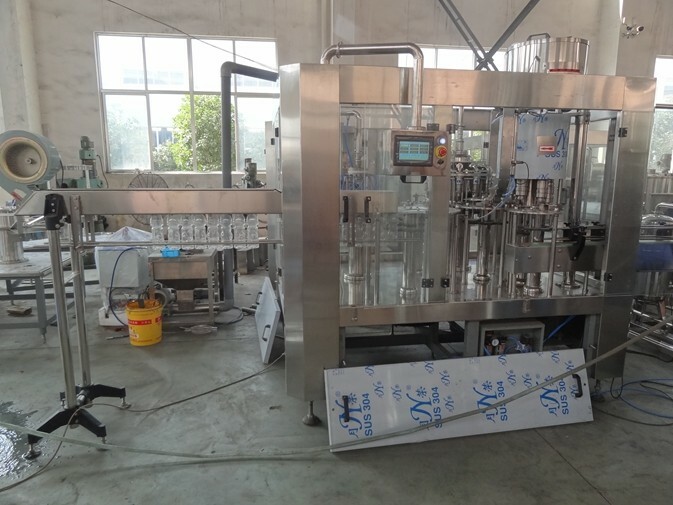 High efficient hot filling machine/filler range from 1000bph to 20000bph, can apply to juice, tea, sport drinks, function drinks, etc. Size of bottle: 200ml-2000ml round PET bottle. Rotative rinsing turret one treatment, fixed nozzles, with grippers. The grippers take the bottles from the inlet starwheel while they are still driven by the starwheel, thus guaranteeing a safe grip. After the gripping, the bottle is turned upside down and centred above a spraying nozzle which directs a stream of rinse water into the bottle. After the draining period the bottle is turned over to an upright position again. The starwheel drive the bottles always "by holding bottle neck" through the rinsing, filling and capping steps. For different types of bottle, it is easy to adjust the structure by our specialized design. Product bowl can reduce the loss of heat. If the temperature is low than the setting value, the filling valves will stop and return the last beverage in filling valve to recirculation tank and be pumped return to UHT again to be sterilized and heated. The fixed part consists of the cap-sorting bowl, the cap feeding elevator with relevant motor and the cam actuating the capping heads. The heads are raised and lowered by the action of a follower that is riding on a shaped cam.